Concertino for button accordion (bayan) and plectrum ensemble, op. 241/2 / Eric Gross. Instrumentation: Button accordion, plectrum ensemble: mandolins I and II, mandola, guitar, bass. Difficulty: Advanced — Professional or good student/amateur. Dedication note: For Elizabeth Jones and the Sydney Mandolins. Score [ePDF]: Concertino for button accordion (bayan) and plectrum ensemble, op. 241/2 : [eScore] / Eric Gross. Parts: Concertino for button accordion (bayan) and plectrum ensemble, op. 241/2 / Eric Gross. 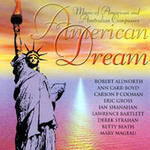 CD: American dream : music of American & Australian composers.